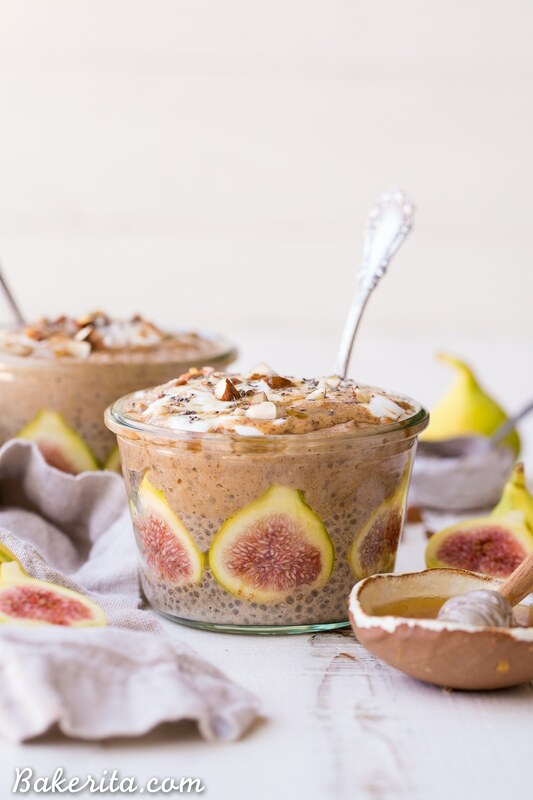 These Cinnamon Fig Chia Pudding & Overnight Oat Breakfast Parfaits are a delicious make-ahead breakfast that you’ll love to have ready to go in your freezer! The fresh figs are such a scrumptious and beautiful treat in this gluten-free, refined sugar-free, and vegan breakfast. I’m not sure when the first time I had a fig was, but it certainly wasn’t memorable, because I can’t remember ever having them before last year…except in Fig Newton form. It just wasn’t a fruit my parents bought, and the season comes and goes so quickly that they always flew under my radar. This year though? I’ve been going crazy for them – they’re so beautiful and delicious. Figs sliced up with nut butter has been a go-to snack for me lately. I love them with peanut butter or almond butter or just on their own. So heavenly. So breakfast parfaits it is! You do have to make overnight oats and chia pudding, but all that is required is simply stirring/blending things together, transferring to a jar, and letting the magic happen while they chill out in the fridge to absorb. 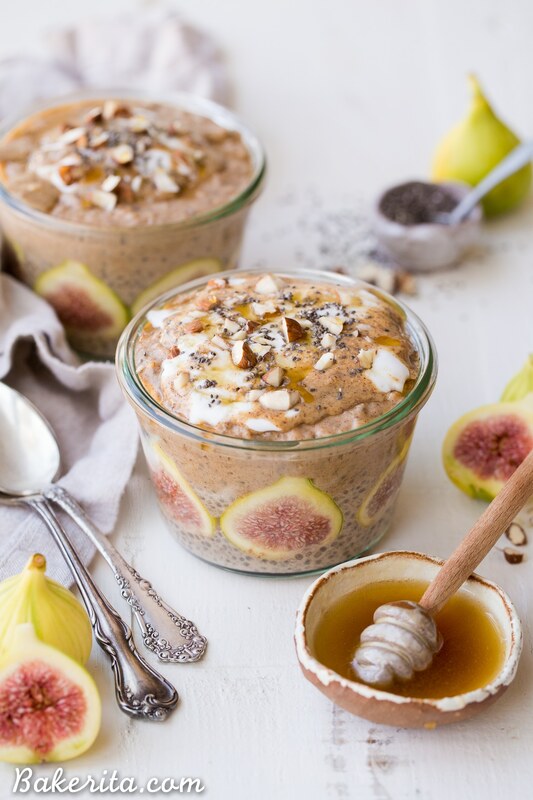 Let’s make Cinnamon Fig Breakfast Parfaits! 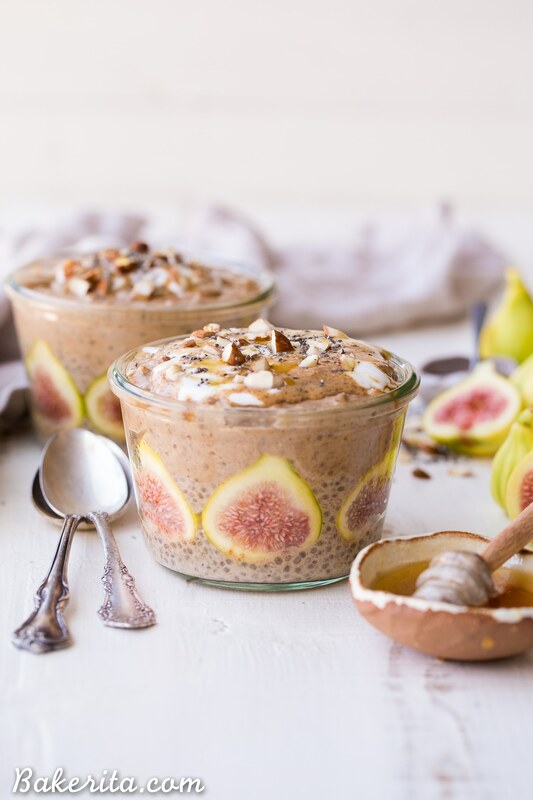 The chia pudding layer is sweetened with a couple of dates and flavored with some almond butter and cinnamon. The overnight oats have cinnamon and almond butter in them too, and they’re sweetened with a touch of maple syrup. The similar flavors but different textures are such a good combo. Once it’s all absorbed, layer all that goodness with figs, almond butter, chia seeds, and coconut yogurt (or whatever toppings/fillings you’ve got and are calling out to you…granola would be good, along with all the other fruits or nut butter that your heart desires). Then, your breakfast parfaits are ready to eat, or store in the fridge for up to a week! They are the perfect make-ahead breakfast and it is SO filling and incredibly tasty. The fresh figs paired with the almond butter and cinnamon is the perfect fall breakfast. I preferred eating it chilled because it’s been so hot here, but you can also warm it up in the microwave if you prefer. 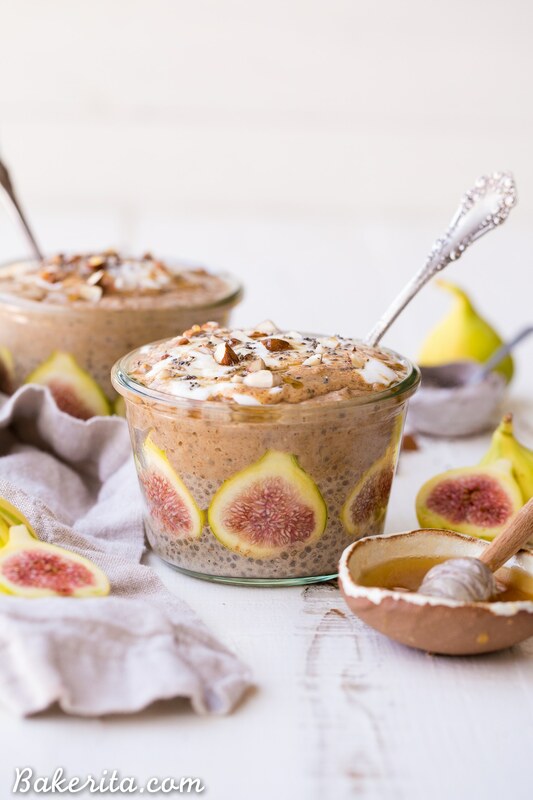 These Cinnamon Fig Chia Pudding & Overnight Oat Breakfast Parfaits are a delicious make-ahead breakfast that you'll love to have ready to go in your freezer! The fresh figs are such a scrumptious and beautiful treat in this gluten-free, refined sugar-free, and vegan breakfast. In a blender, combine the unsweetened almond milk, dates, almond butter, and cinnamon. Blend at low speed until the dates are broken up into the almond milk. Pulse in the chia seeds, just enough to mix in but not enough to pulverize them. Wait 15 minutes for them to plump up a bit, and then pulse one more time to re-mix. Transfer to a bowl or jar, cover with plastic wrap or a lid and place in the refrigerator for at least 4 hours or overnight. In a bowl or jar, stir together the gluten-free rolled oats, almond milk, maple syrup, almond butter, and cinnamon. Cover with plastic wrap or a lid and place in the fridge for at least 4 hours or overnight to let the milk absorb. When the oats and chia pudding are absorbed and thickened, you can assemble the parfaits! I used two jars, but I’d recommend using four so there’s one serving in each. 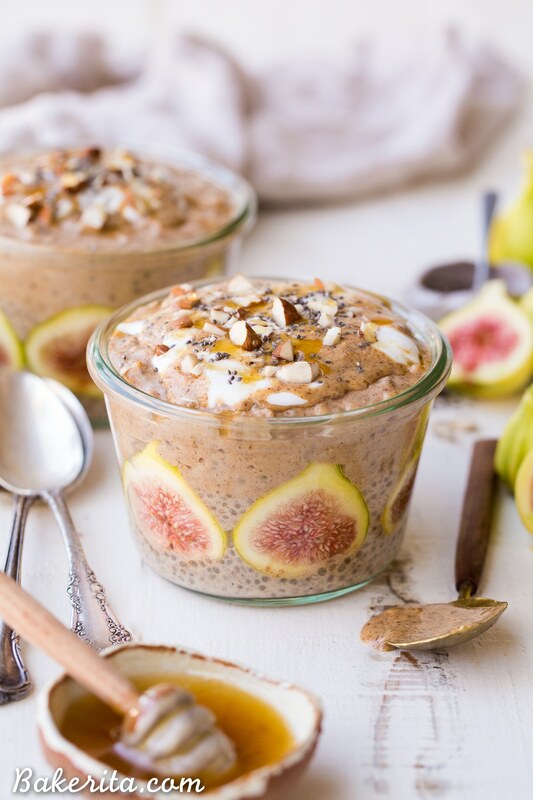 Divide the chia pudding between the jars, and then line the sides and middle with fresh figs, and then put the overnight oats on top. You can add a little coconut yogurt, almond butter, and/or any other fillings you’d like between the layers too if you want, or just put them all on top like I did! After layering, you can eat immediately or store in the refrigerator for up to a week. Enjoy! So good, right?! Thanks for the love Brittany – hope you love the recipe!